Solid, smooth steel deck is all welded and features structural reinforcement underneath for extra strength. 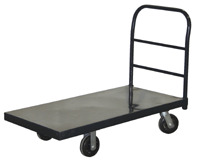 Includes one removable high-polished steel handle and rolls smoothly on two rigid and two swivel casters. Series V-SPT comes standard with floor lock and durable blue powder coat finish. 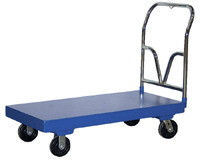 Model V-ECSPT-2448 - Economy truck has 6" x 2" casters and a 2000 lbs. capacity.